Despite your best efforts to prevent it, has your dentist recently recommended extracting some of your teeth because they simply can’t be saved? This isn’t an uncommon scenario! Many people weren’t able to take great care of their teeth as children and young adults, and are still feeling the repercussions of that many decades later. Even if you start to devote the time and energy to your oral health as an adult, sometimes it isn’t enough to prevent tooth loss. In addition to losing teeth, you’re also faced with a decision about whether you should choose implants or dentures. If you’d like more information about which choice is the best, a dentist in Palm Bay discusses this topic and explains the benefits of both options. What Are the Differences in Implants and Dentures? Of course, both of these treatments will replace your teeth. The main difference is that implants also replace the roots of your teeth as well. Why is this important? Many people don’t realize it, but tooth loss can actually lead to bone loss in the jaws. The roots essentially signal to the body to maintain the bone around them. When they’re missing, the jaws will start to “shrink” in size. Since dentures don’t include the root, over time they can result in changes in the shape and size of your jaws. That simply means that they’ll need to be re-fit from time to time. Your dentist will take images to evaluate your current bone levels and can explain more about how this might affect you. What Benefits Can You Expect From Each Option? In addition to reading about the benefits of each choice, scheduling a consultation with your dentist is a great way to determine whether implants or a denture may serve you the best. Your dentist will be able to assess your individual needs and make recommendations for you specifically! Can last for 5-10 years. Modern advances mean they fit better than ever. 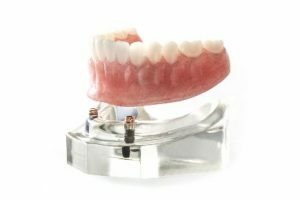 If you’re missing several teeth or all of your teeth, dentures can be customized for your needs. Implants can also be used for a wide variety of situations. Several missing teeth can be replaced with an implant bridge, while an implant-retained denture can be used for an entire arch. Can last for decades, or even a lifetime. Maintains and protects the bone levels in the jaw. Will feel and function more like your natural teeth than any other option. Regardless of whether you choose implants or dentures, you’ll be on your way to restoring your smile and your self-confidence in no time! Dr. Christopher Nowacki has been practicing general, restorative and cosmetic dentistry for nearly 15 years. Always striving to provide the best comprehensive dental care, he takes the time to explain the pros and cons of treatment options so that his patients can make informed choices about their oral health. He can be reached for questions through his website, or at (321) 724-9300.